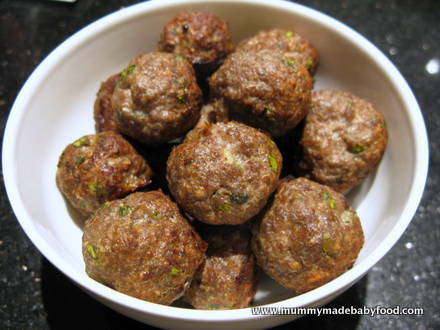 Meatballs are ideal for baby finger foods, as they are easy to grab and universally eaten in just about every culture around the world. They can be baked, fried or braised, eaten with sauce, soup or dry - the possibilities are endless. Meatballs are easily adaptable and can be made with any kind of meat you prefer or even translated across to fish to make fishballs! Children tend to be drawn to round objects because they roll and are pleasing to look at, so meatballs are particularly fun for them to grasp and eat (finally something round they can stick into their mouths!). Round baby finger foods can be a bit challenging if your little one has not yet developed sufficient coordination, but you can easily make this recipe into mini meat fingers (long sausage-like shapes) that are easier to grip. 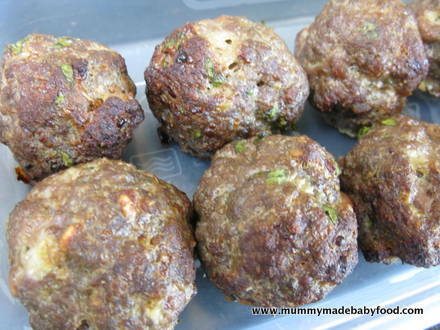 For slightly older children, these meatballs can be flattened to make mini patties that can be dropped into mini pittas for an easy pack lunch. If you want a more substantial meal, meatballs go nicely with tomato sauce and pasta or rice on the side. Or they are perfect on their own for a lighter lunch or as picnic fare, with some green salad or vegetables on the side. 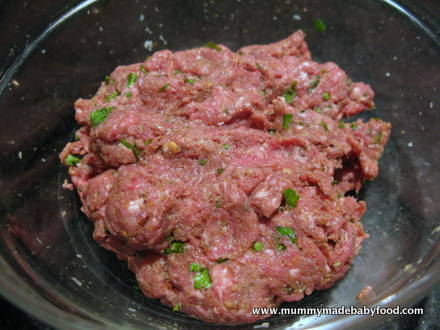 If you are making these for a young baby who has not yet developed good chewing skills or have many teeth at the back of his mouth, you will probably need to deconstruct the meatball and feed it to him as meat crumbs. To make it more palatable, try mixing it with some tomato sauce over rice or pasta, and spoon feeding it. This recipe yields approximately 20 mini meatballs. Preheat the oven to 200C / 180C Fan. Line a baking tray with aluminium foil. 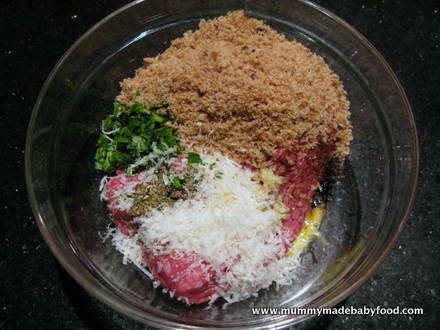 Add all the ingredients into a large mixing bowl. Mix well with your hands until all the ingredients have been thoroughly combined. You could use a food processor for a really uniform and smooth mixture. Take a spoonful of the mixture, and roll it into a ball about the size of a golf ball. Wetting your hands slightly will keep the mixture from sticking to your palms. Space them evenly on the foil-lined baking sheet. 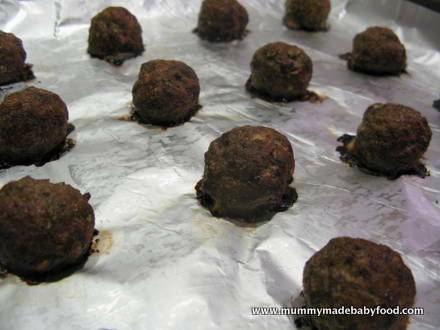 Bake the meatballs in the preheated oven for approximately 20-25 minutes, until cooked through. 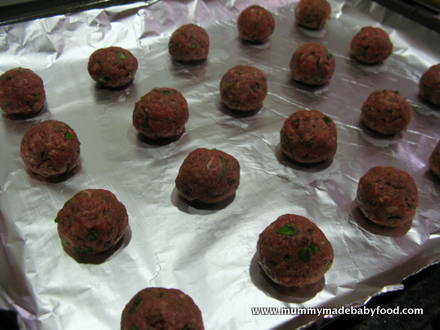 Allow the meatballs to cool sufficiently before serving.